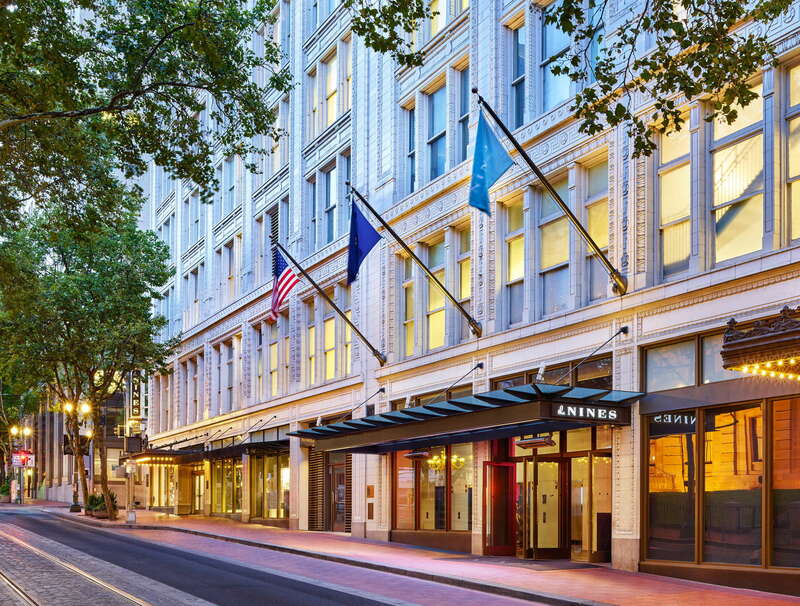 Located right in the center of downtown Portland and just steps from “Portland’s Living Room” Pioneer Courthouse Square, The Nines Hotel is an elegant, contemporary hotel located in the historic Meier and Frank Building. 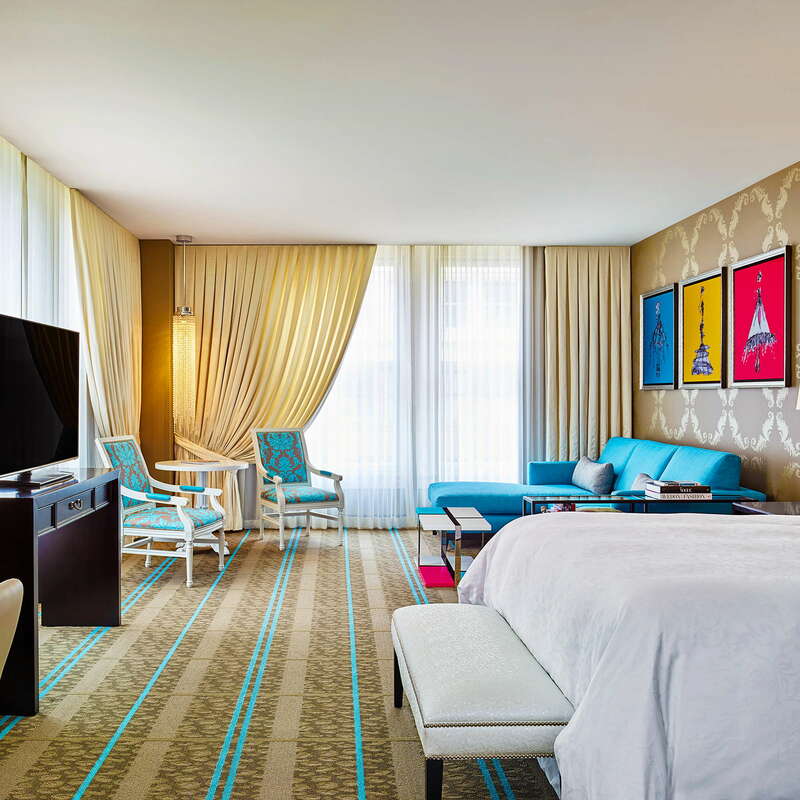 The impeccable design and unbeatable views make this hotel a must-visit for Portland visitors looking for a more upscale experience. YOU SHOULD KNOW Pioneer Courthouse Square plays host to over 300 events per year, which is great if you want to experience the liveliness of the city… but not so great if you’re looking for peace and quiet. 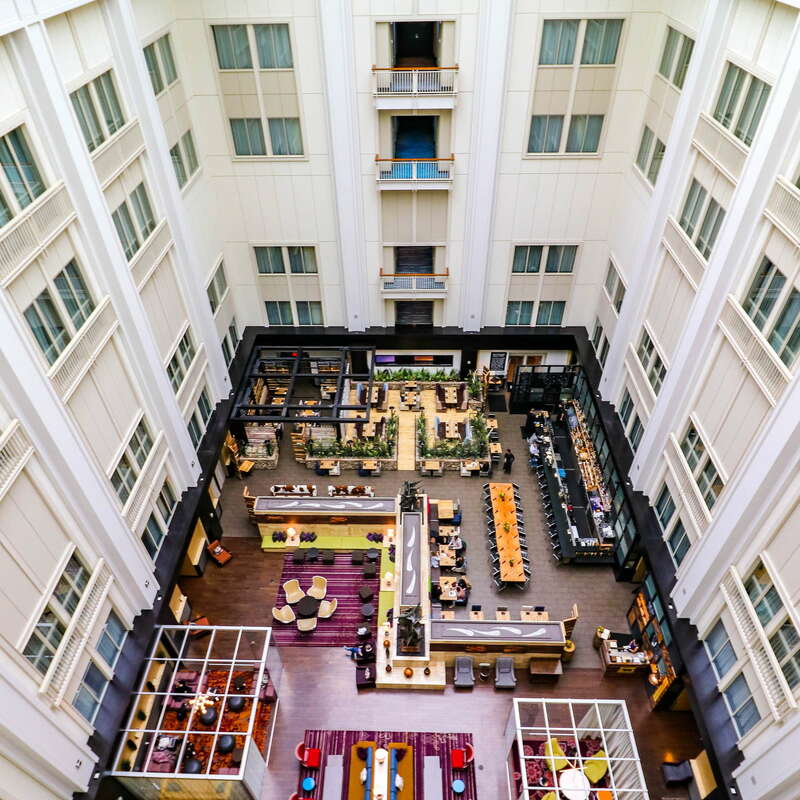 If you’re looking for a hotel experience tucked away from the hustle and bustle of the city, this probably isn’t the right location for you. 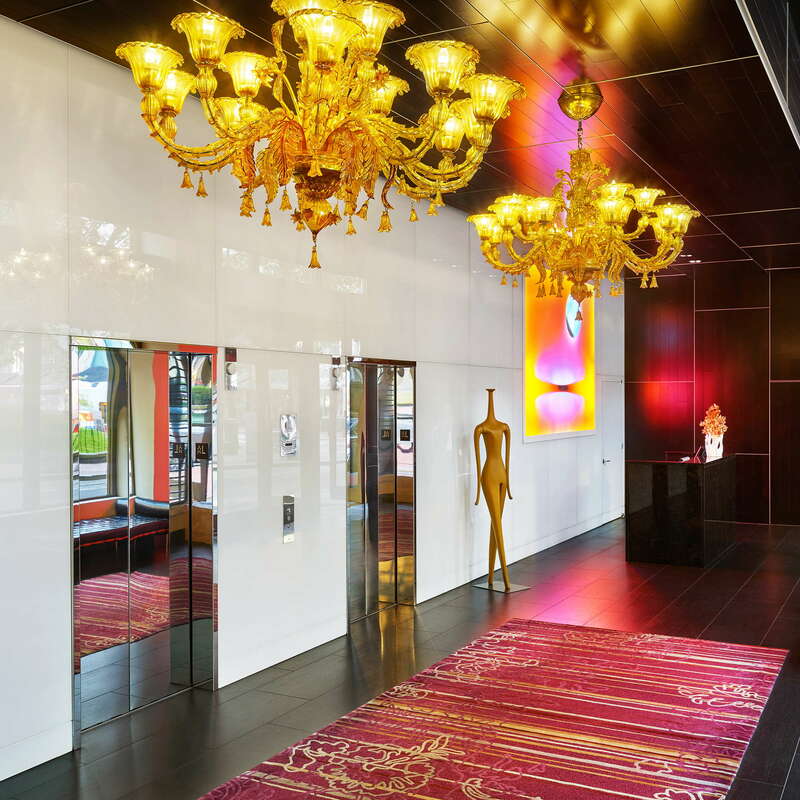 At The Nines Hotel, each room is literally “dressed to the nines.” Design details like tufted leather headboards, velvet recamiers, and crystal lighting will make you feel like you’re living in “Breakfast At Tiffany’s” - in a good way, of course. 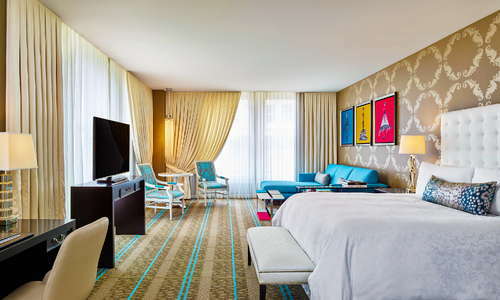 And in a nod to their hometown heritage, all the art featured in the guestrooms is created by students at Pacific Northwest College of Art. Requesting a room with a view? Make sure you specify what kind of view you’re after. The Nines has rooms with both city and atrium views. The spacious bathrooms, which mirror the sleek, modern design of the guestrooms, all come fully stocked with BeeKind bath and body products from Glichrist and Soames. 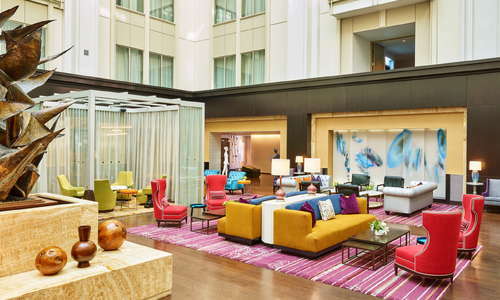 The Nines lobby, located on the 8th floor of the Meier and Frank Building, is not to be missed. 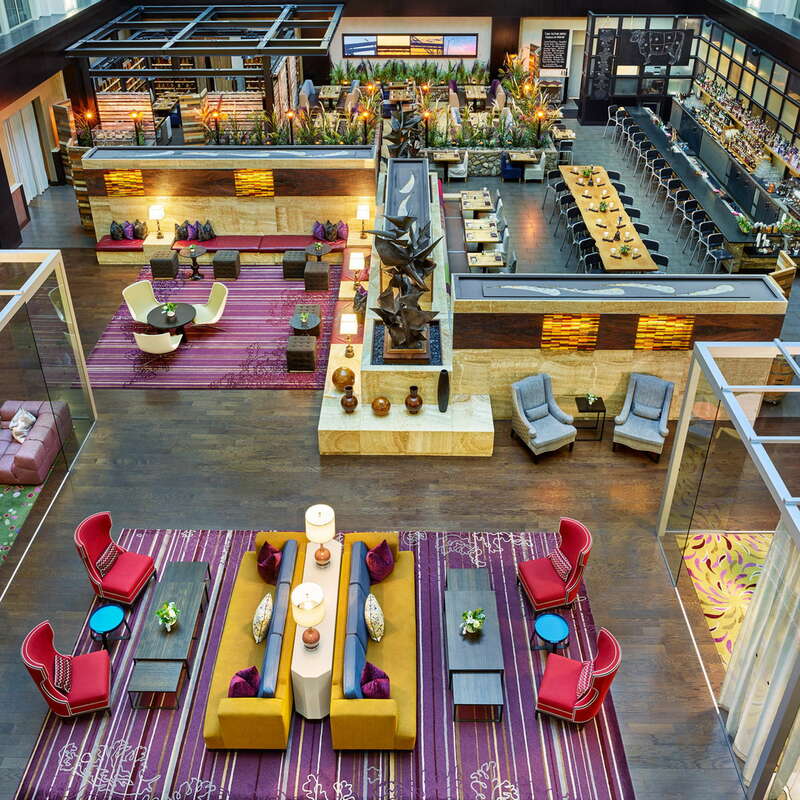 The huge, open-floor atrium is home to the property's two restaurants as well as plenty of plush seating. 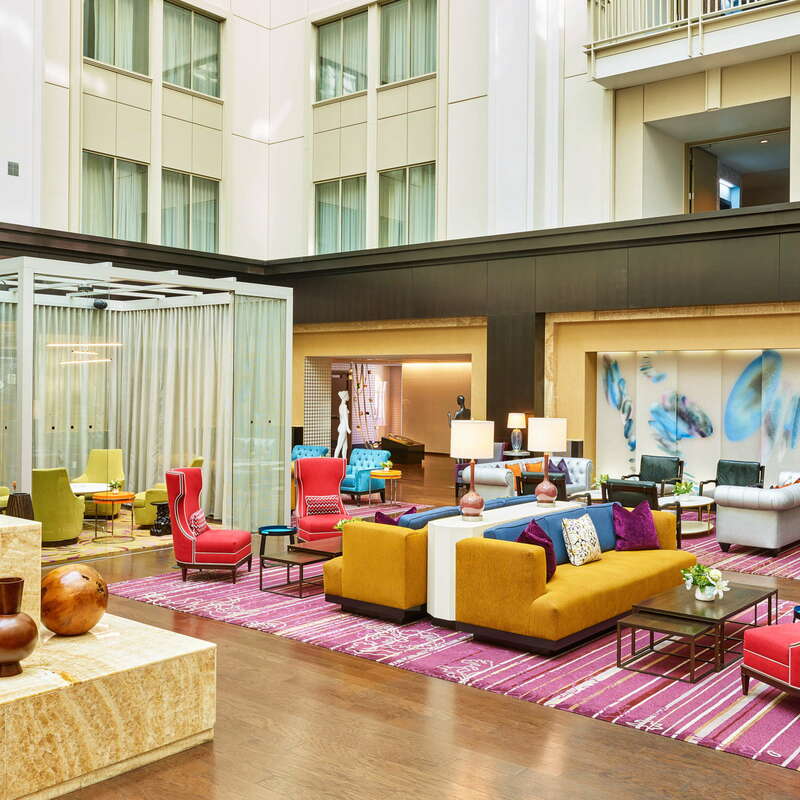 The lobby is always lively, so make sure you carve out a few minutes of your stay to settle in and enjoy the hustle and bustle. Tip: The Nines is a dog-friendly property, so feel free to bring your four-legged friend to the lobby to enjoy some people watching and a coffee or a drink (for you, not your pooch). The Nines’ gym has high-end cardio equipment along with a great selection of free weights. The gym is also equipped with flat-screen televisions so you can catch the news (or the latest episode of “Real Housewives”) while you get your sweat on. And it’s open 24/7, so there’s no excuse not to take advantage. Farm to table dining is a staple in the Portland dining scene, and you won’t find it done much better than at Urban Table, one of The Nines on-site restaurants. Urban Table serves breakfast, lunch, and dinner seven days a week and is a favorite with hotel guests and locals alike (make sure to catch their weekend brunch, where you can try the popular Honey Biscuit, a hearty meal with fried egg, sausage gravy, crispy chicken leg, and lemon marmalade). Looking for a more relaxed dining experience? 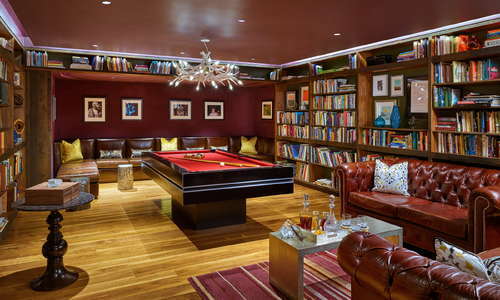 Head to The Library, where you can enjoy a game of billiards along with an all-day lounge menu and cocktail service. While there’s no "bar," per se, at The Nines, all the hotel’s dining options offer fantastic drink options. Enjoy a glass of local wine from Urban Table (their wine list features nearly 200 varietals from Oregon, Washington, and California) or grab a specialty cocktail from Departure Restaurant (which also has an impressive collection of Japanese whiskeys). 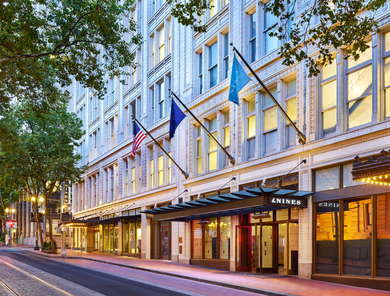 The Nines is right in the thick of Downtown Portland, and getting around on foot or using public transportation is simple (there’s a MAX station right outside of the hotel that services the city’s blue and red lines). If you must bring a car, expect to pay $47 per night for valet parking ($35 for hybrid vehicles). 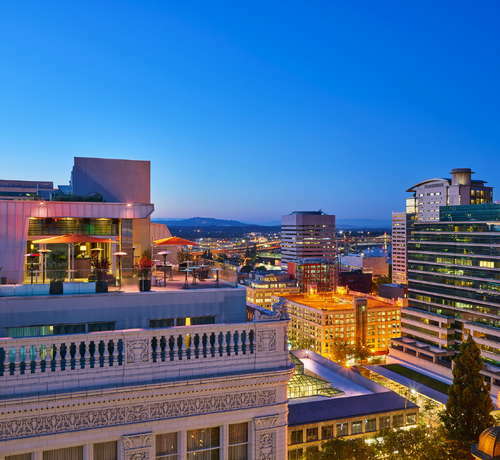 The Nines is conveniently located to some of the best dining Portland has to offer. Make sure to visit Higgins (8-minute walk), a Portland staple serving up sustainable PNW dishes paired with local Oregon beers and wines. Tasty N Alder (8-minute walk) is also a local favorite that can’t be missed; the restaurant serves up one of the most beloved brunches in the city (just make sure to get there early if you don’t want to wait an hour for your eggs benedict). Portland is known as “beer-vana” and with good reason - the beers here are some of the best in the country. Make sure to pay a visit to Bailey’s Taproom (6-minute walk), which features a rotating selection of some of the best beers Portland has to offer. Portland is also famous for its dive bars, so make sure to pay a visit to Yamhill Pub (4-minute walk), a delightful dive complete with graffiti wall-art and discount pitchers that stays lively to the wee hours of the morning. 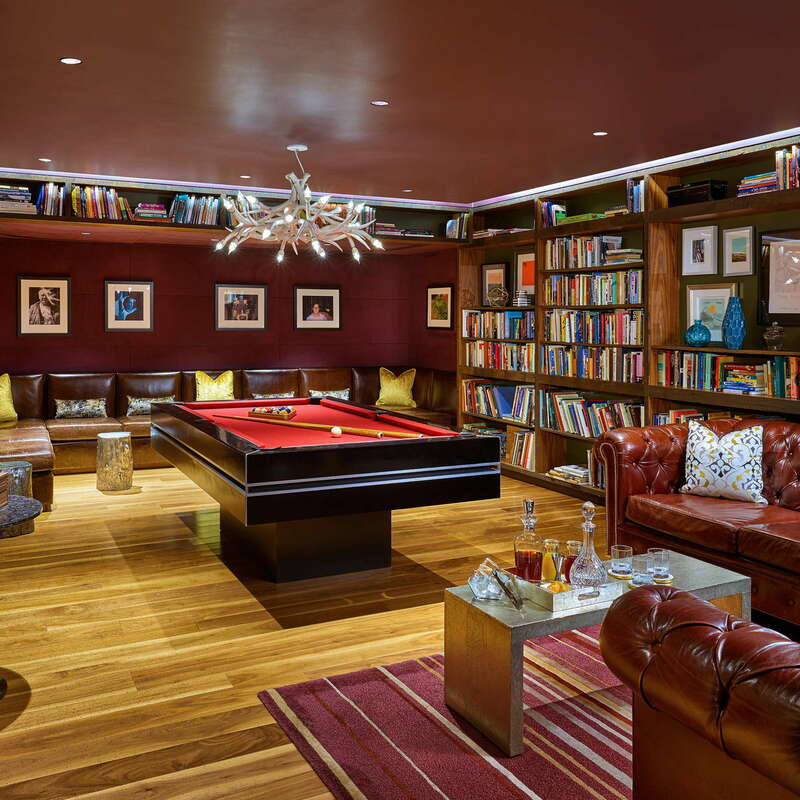 The Nines has it all. 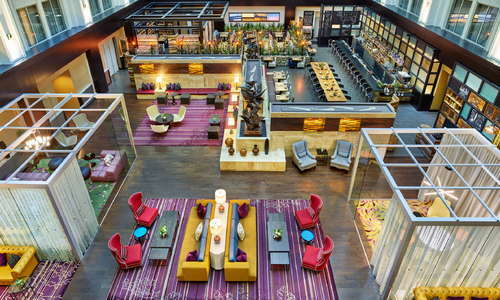 It’s one of the most beautifully designed hotels in Portland and it’s just a hop, skip, and a jump away from all the amazing culinary and cultural experiences the city is known for. 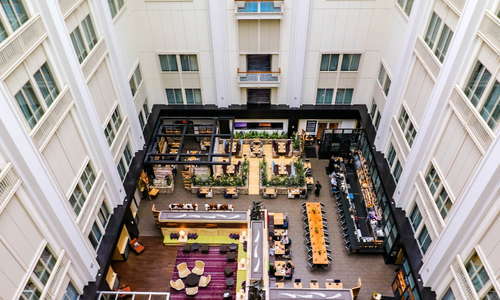 While this hotel isn’t the best option for travelers on a budget (rooms tend to be pricey even during the slow season), if you’re willing to splurge to get a taste of the best Portland has to offer, The Nines is the way to go.